Our chapter was formed in 1985. We currently have 32 members. R.O.S.E. means Richmond's Own Society of Embroiderers. Rose Chapter hosted State Day on October 11, 2008, in Richmond Indiana. The event proved to be a wonderful experience for the dedicated members of our Guild and a successful day for all the welcomed guests. Rose Chapter is proud to announce that a collection of our work was presented and exhibited at the Richmond Art Museum from May 31, 2009 until June 28, 2009. Rose Chapter was pleased that our own Corinne Clift was appointed to be the Assistant Director of the Great Lakes Region before becoming the Region Director in 2010 and 2011. We are very proud of Corinne for this honor. ROSE Guild members holding Group Correspondence Course in Stumpwork, Fantasy Remembered, taught by Luan B. Callery. 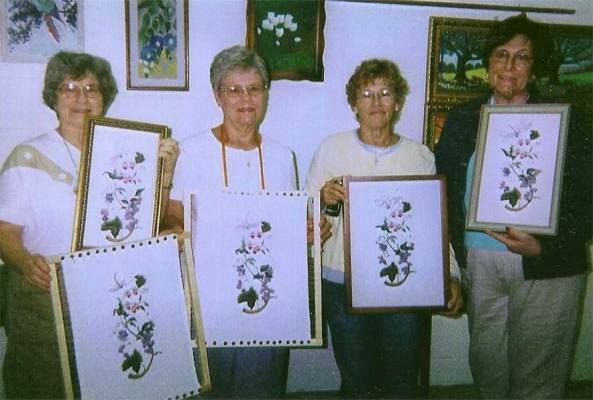 L-R: Shirley Irvin holding her framed work, also holding Gerry Leidlein's work; Mary Jane Dolehanty; Linda Force; Cordelia Zinken.